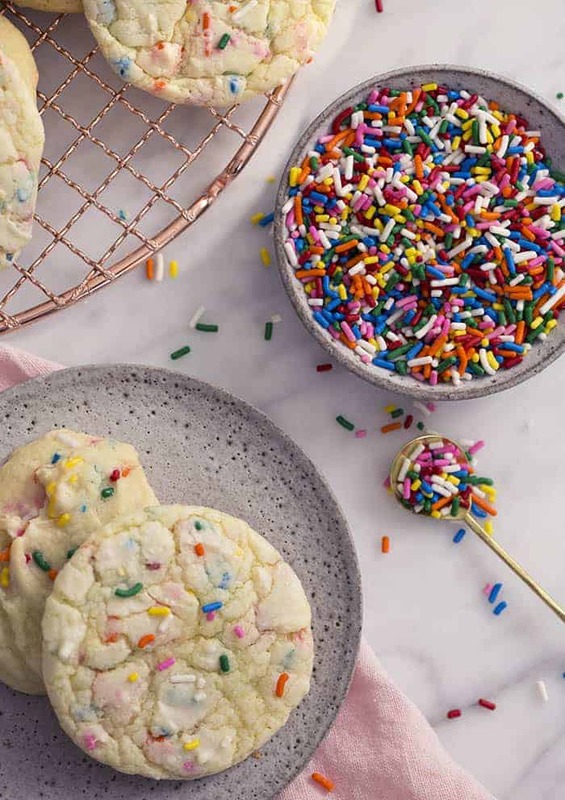 Cake mix cookies are the ultimate no hassle treat! 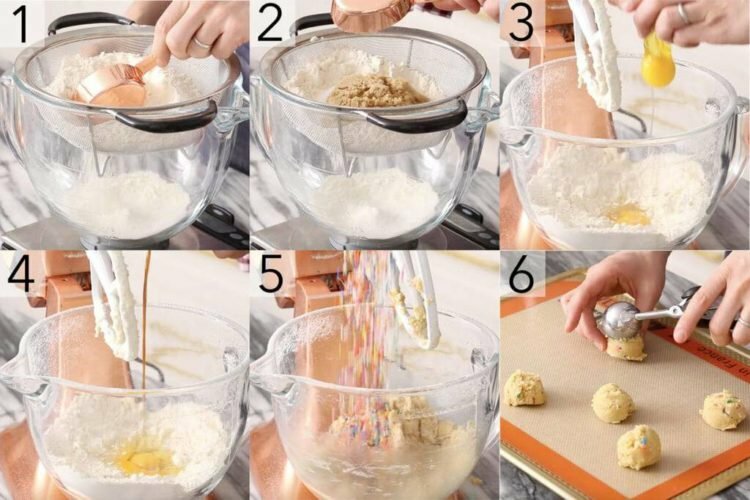 You can whip them up in a moment an have delicious soft cookies in no time. I’ve included a phenomenal from scratch version that’s a must try in the post too! Everyone seems to have a box of cake mix hanging out in the pantry but it can be used for more than just cake! 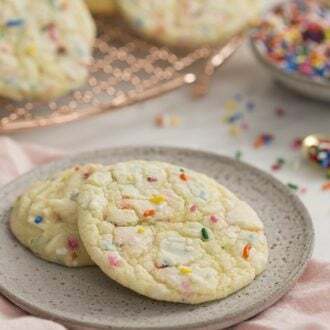 Cake mix is great for making soft chewy cookies that might just have a healthy dose of rainbow sprinkles in them! How can you make box cake mix better? While box cake mixes are the epitome of convenience the taste isn’t the best. 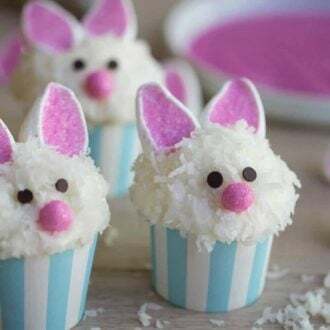 To improve the flavor try adding some real vanilla, sub in some melted butter for the oil and add ingredients you love like strawberry pieces, chocolate chips, sprinkles or even toasted nuts! Chocolate cake mix can be improved with an extra 1/4 cup of cocoa powder and/or 1/3 cup mini chocolate chips mixed into the batter. Cookies can be frozen and reheated later. Make sure to chill in a sealed container and allow to thaw before warming. Cookies can be frozen for up to two weeks. What’s the difference between a cake and a cookie? Cakes have more liquid thank cookies. 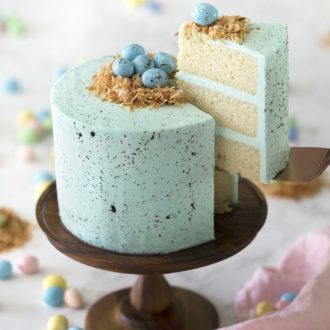 When baked the leavening agents in the cake batter allow it to rise and create a fluffy texture while cookies will puff up slightly but flatten out after baking. Cookies have a denser texture and can range from chewy like this one to very crispy. How do I make cake mix cookies from scratch? 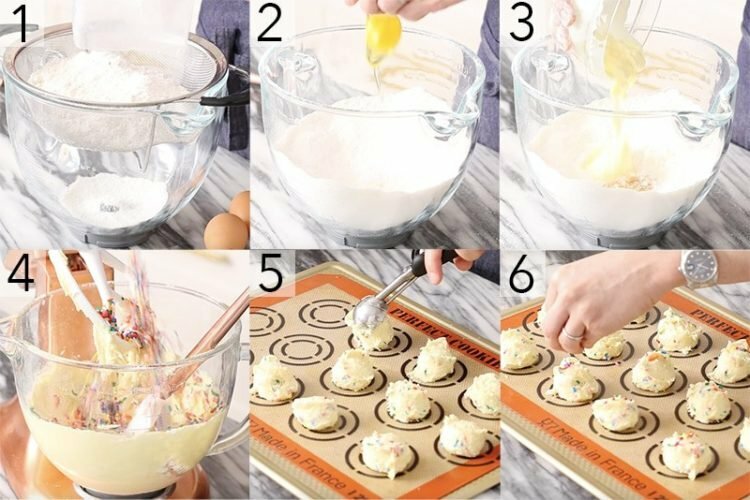 How do you make cake mix cookies? 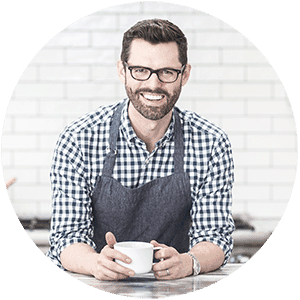 Start off by preheating the oven to 350 degrees F and sift the cake mix into a large bowl or the bowl of a standing mixer. Crack the eggs into the bowl with the cake mix. Now add the room temperature butter. My butter was so soft it was basically melted. If you don’t want to use butter, you can use 1/3 cup of vegetable oil. Mix the batter together until everything is well combined, then pour and fold in the sprinkles. Place dollops of the batter that are about 2 tablespoons in size, onto a prepared baking sheet. 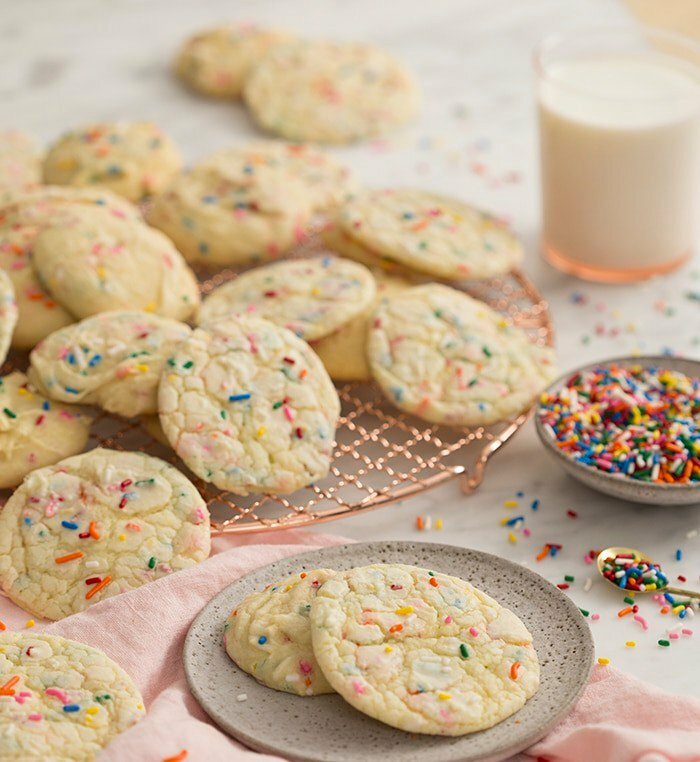 Sprinkle the tops of each cookie with a bit more sprinkles and bake them for about 10 minutes. 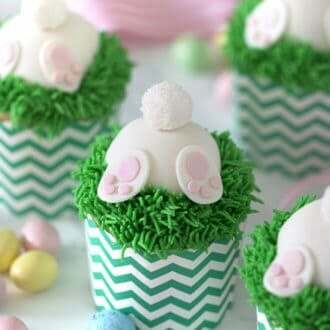 When their done, transfer them to a wire rack to cool and enjoy! Preheat the oven to 350 degrees F and pour the four and white sugar into a sifter over a large bowl or the bowl of a standing mixer. Add the brown sugar, baking powder and salt into the sifter. Sift then give the mixture a whisk to make sure everything is well incorporated. Add the room temperature butter and give it a quick mix. You should have a crumbly sort of mixture. Now crack the eggs into the bowl with the mixer running on low. make sure each egg is well incorporated before adding the next. Mix the batter together well, then pour and fold in the sprinkles. This batter should be more like a cookie dough. Place about 2 tablespoon sized dollops of the dough onto a prepared baking sheet. 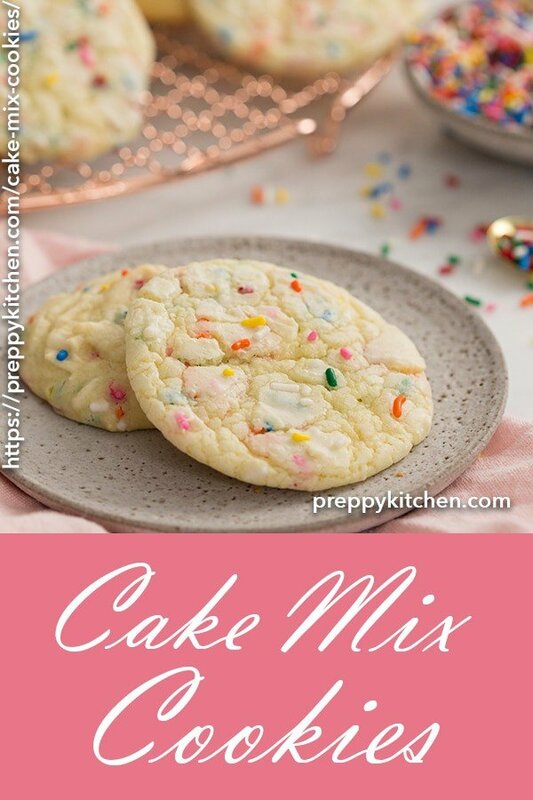 If you’ve tried these cake mix cookies then don’t forget to rate the recipe and let me know how you got on in the comments below, I love hearing from you! Im one of the people that had a box of cake mix in my kitchen forEVER (not expired) hehe. This recipe made any cookies i could have made so much better! and i finally used my cake mix. I love your site John! I used red velvet cake mix and your cream cheese frosting recipe. I took them to a potluck, and they were a major hit! Thank you. 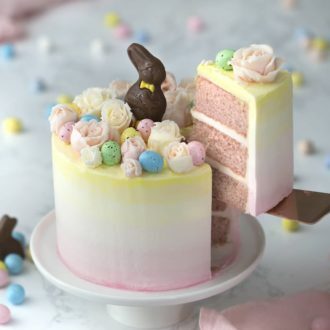 Can I use a yellow cake mix instead of white?